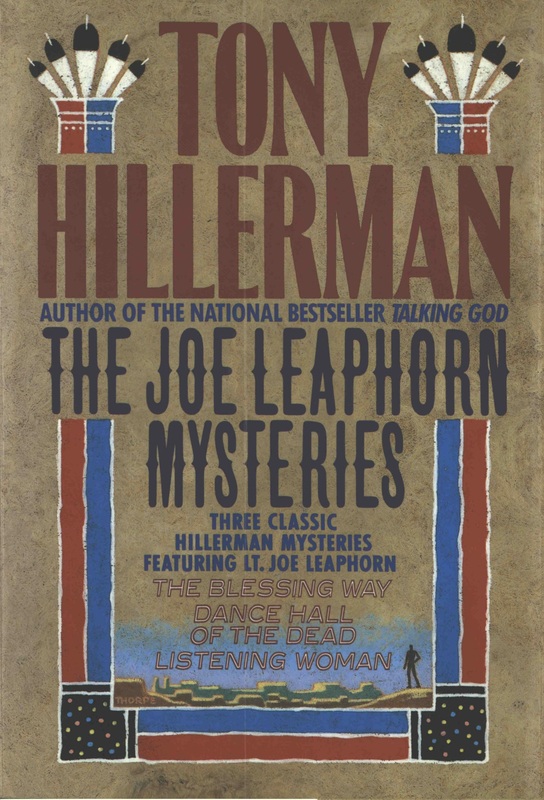 This is the full and detailed views of the cover of the first edition of The Joe Leaphorn Mysteries: Three Classic Hillerman Mysteries Featuring Lt. Joe Leaphorn. This is an anthology of the first three novels in the Navajo Mystery Series, including: The Blessing Way (1970), Dance Hall of the Dead (1973), and Listening Woman (1978). This edition was originally published in 1989 by Harper & Row Publisher's INC. in New York. Design and Photography Credits: The jacket design is by Peter Thorpe and features the outline of a man with his right hand resting on his hip surrounded by a sand painting stylized Southwestern vista. The title and this image are bounded by a red and blue sand painting border which is topped by five feathers. This edition also has two fold-outs, the front fold-out contains a brief synopsis of the anthology and the back fold-out contains a photography of Tony Hillerman by Barney Hillerman and a brief biography.